Cypress covers a broad range of plant life, and with that variety comes a widely divergent range of sizes. Even among the cypress plants that are considered trees, there are differences. Some cypress trees are classified as evergreens and others as deciduous. One thing most American cypress trees have in common is their statuesque height. Cypress is a name given to family of plants that covers everything from ground covers such as the Russian cypress to bushes and towering trees. When you think of a cypress tree, however, it is usually the towering bald cypress, which grows in the Ohio or Mississippi valley regions, or Leyland cypress, which grows in almost all the southern states. Another common cypress tree found in parts of the United States is the Nootka cypress, which grows in western North America. Cypress trees can grow in a wide variety of soil types and conditions, with different varieties being more suited to specific conditions than others. For instance, the bald cypress or pond cypress thrives in standing water such as swamps or coastal locations where some flooding occurs. Leyland cypress trees prefer well-drained soils and grow best when they are upland, which avoids damp conditions around the roots. As long as the cypress tree has the proper growing conditions for its particular variety, it should be able to achieve its full height. The Russian cypress, actually an evergreen ground cover, reaches no more than 2 feet in height. The Nootka cypress ranges between 40 and 90 feet in the wilderness, where it can live for more than 1,000 years. However, in home landscapes, it tends to achieve a considerably shorter stature. The Leyland and bald cypress often exceed 100 feet at maturity. The Leyland is frequently used as a Christmas tree, and, as such, is harvested at about 3 to 6 years of age when its height averages is 6 to 9 feet. Cypress trees are able to achieve their impressive heights because of their medium to rapid growth and long life spans. Most other trees common to the United States average 12 to 18 inches of new growth annually. 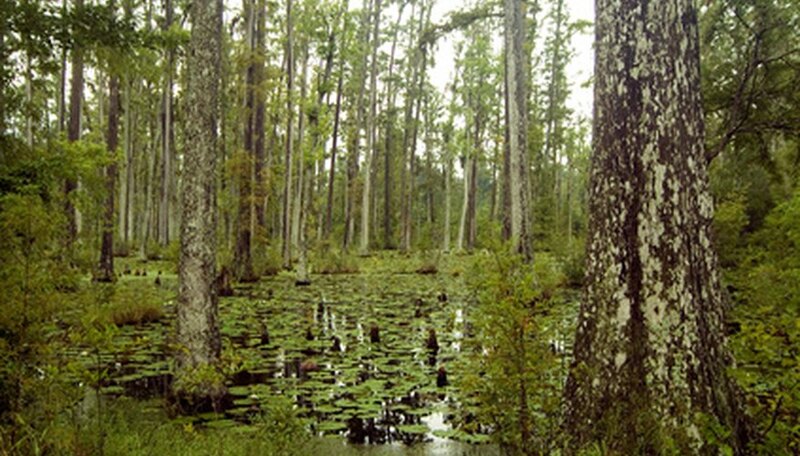 The towering cypress trees such as the Leyland have an average annual growth of 2 to 3 feet. The bald cypress has a medium growth rate of 18 to 24 inches annually. With their wider bases and their slender trunks, they can reach skyward, surpassing many other trees within 10 to 15 years. Some of the properties of cypress trees, particularly bald cypress’ ability to resist drought, can have impact on their growth. Serious drought will slow their growth but does not seem to be a major threat to the tree’s overall health. Cypress trees have few pest and disease issues but the few that exist can have an impact on the trees' health and size.